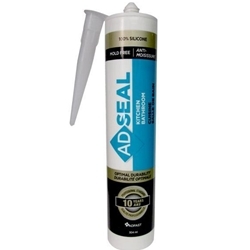 This 100% mildew-resistant silicone sealant is a premium quality construction sealant used to meet a variety of needs. It cures to silicone rubber and adheres to glass, wood, metal, porcelain, ceramic tile, and painted surfaces. Due to its non-sagging properties, it can be applied above the head, on vertical wall joints, and lateral surfaces.